My father and I visited Grammy Gertie over the weekend, and actually made one of the recipes! The dish in question was Wilted Lettuce, a favorite of Grammy's. It's actually not as unhealthy as I originally thought -- it's more like a salad with bacon bits. I would actually make this at home for guests. The name seems a little misleading - it would be better to call this something like "salad with a tangy dressing." Anyway, Grammy says hello to everyone. 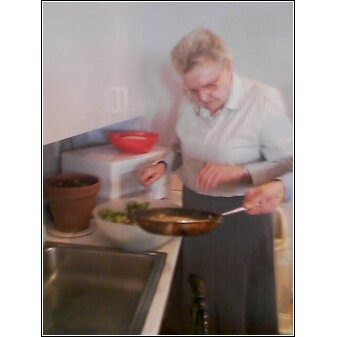 Here's a photo of her, chopping and sauteing away!